The story of Cyrano de Bergerac has been told innumerable times. This story is a fictionalized account of a real person, and the play that started it all was penned by Edmond Rostand in 1897. The original play has been translated into many languages and adapted into other plays and movies worldwide over the years. 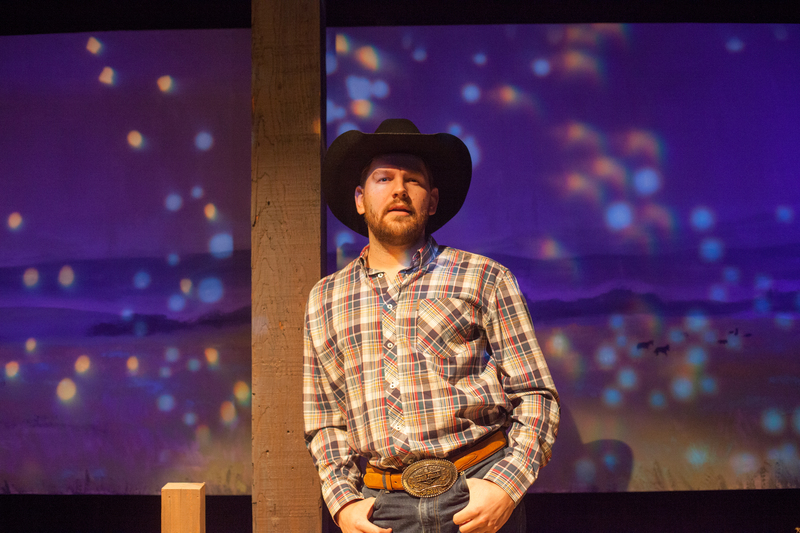 In 2006, a new stage adaptation entitled Cowboy Versus Samurai, written by prolific playwright and screenwriter Michael Golamco, was published. The Pear is currently presenting this Golamco incarnation which moves the action to Breakneck, Wyoming, and adds a few new elements to the story. Golamco has been quoted as saying that his play is “Cyrano de Bergerac with race as the big nose,” although there is far more involved than mere physical attractiveness. 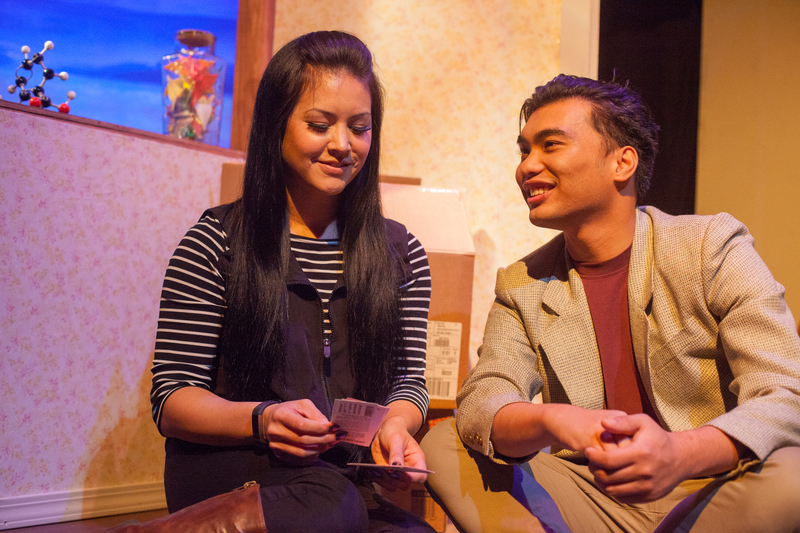 In Breakneck, there are initially only two Asian Americans in town. Travis Park (Lorenz Angelo Gonzales) is a high school English teacher. He’s a Korean-American transplant from Los Angeles who arrived in town a few years earlier in an attempt to get away from the chaos of the big city and the shambles of his life there. Chester A. Arthur (Chuck Lacson) is the only other Asian American resident. Chester was adopted by a local, white family as a baby, and he has been searching for a key to his biological heritage his whole life. Del (Drew Reitz) is the school’s P.E. teacher and a wannabe cowboy. He is a stereotypically, dim-witted jock who uses the word dumb as a noun in reference to himself, i.e., he is “a dumb.” Veronica Lee (Heather Mae Steffen) is another Korean-American who moves into town adding a third Asian American to the mix. She’s recently arrived from NYC and is the high school’s new biology teacher who shares a classroom with Travis. Like Travis, she has come to town to escape some of the big city chaos. Chester founded BAAA – the Breakneck Asian American Alliance – to address Asian oppression, such as trying to get the local grocery store to carry tofu. Their organizational meetings are a source of witty repartee and consternation. Travis and Chester are the unlikeliest of friends given Travis is erudite and well-spoken, and Chester is kind of a militant hick with delusions of ninja-inspired grandeur. One might initially wonder what, other than race, brought these two together. As the plot thickens, it becomes clear that Travis feels a little sorry for Chester and clearly wants to help him. Veronica’s arrival stirs the pot. Chester sees her presence as a cause for celebration and hopeful conquest. Travis sees her as an intelligent “officemate” and is somewhat smitten given their numerous common interests and histories. The only problem is that Veronica has “preferences” where dating interests are concerned, and those do not include Asian men. Enter Del and the start of the quirky, eloquent Cyrano story. Ting Na Wang’s scenic design is appealing. A unit set is used for this production, featuring a gorgeous mural painted along the entire upstage wall. A classroom door defines the stage right boundary, and a teacher’s desk is positioned in front of the door. A moveable student desk is normally center stage, though that is moved a bit with the action. A working lamppost hugged by weeds is upstage right. A short, wooden, two-railed fence is immediately downstage of the lamppost. The fence runs along the upstage portion slightly in front of and beneath the mural. There is a cottage door on a platform stage left that is used both as a porch and a living space within the cottage, depending on the scene. Jeffrey Lo directs this production beautifully and is assisted by Kaede Komatsuzaki. Lo’s cast isn’t completely authentic for the roles as defined, but his tight ensemble shines. Every characterization and movement is believable, even when some of the dialogue becomes rather farcical at times, particularly where Chester’s militancy is concerned. Lacson is clearly adept at playing larger venues as his exuberance and enthusiasm as Chester more than fill the space. In fact, he is slightly overpowering when viewed from the front row. All four actors show a great deal of depth and sensitivity in their portrayals. While audiences might expect Gonzales’ and Steffen’s characters to show such depth, Reitz and Lacson also evolve through the story. One very heated Act 2 exchange between Chester and Veronica is particularly gripping, each one taking verbal stabs at the other in rapid succession, each drawing the other out in bouts of unexpected honesty and deep feeling. 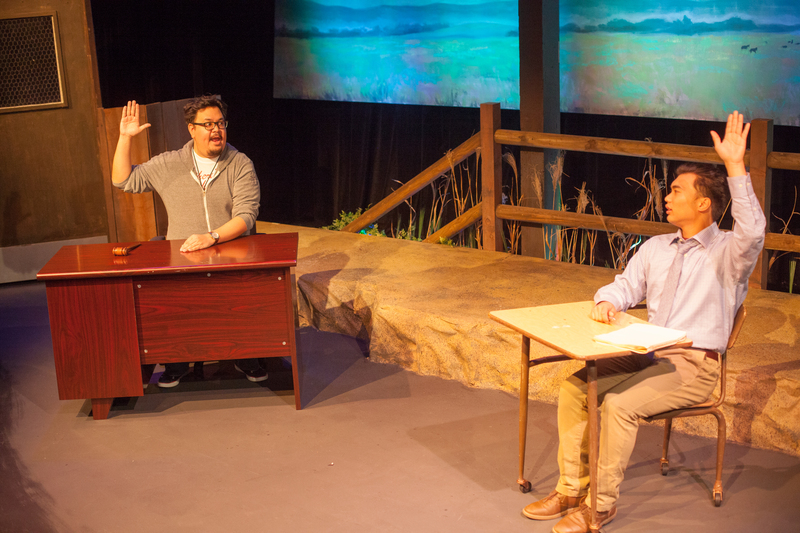 Del too shows insights that one wouldn’t expect from his character through a discussion with Travis late in Act 2. In the end, the story really is about love, not race. The message is that love goes far deeper than strictly the romantic variety. Golamco touches upon romantic love to be sure, but he also delves deeply into love of self, and love as friendship. Golamco makes it clear that one cannot love others if he cannot love himself. The script’s use of the letters Travis writes for Del to impress Veronica provide context and background that is both instructive and entertaining, particularly with Del’s delivery of material through those letters that is clearly not about him. They give the audience, and Del, a detailed look at what makes Travis tick. One minor bit of inconsistency in staging is worth noting. At one point, Travis has all of the letters in hand, and he starts skimming them. The problem is that although audience members cannot read the writing, they can see through the page enough to notice that Travis is holding the letters sideways (at least they can from the front row). Perhaps this is an artistic choice to denote Travis’ life running slightly askew, or it’s an oversight. Lo also provides the sound design for this production, and his choice of music for preshow, scene changes, and intermission provide an interesting mood mix. There is of course some country-western influence as one might expect in cowboy country, but there are also disco and pop elements, and even a hint of Hoagy Carmichael at one point. There is some colorful language and innuendo interspersed along the way, but it is not gratuitous and instead sounds genuine in the course of the discussion. There is also high comedy in the more farcical portions of the story, particularly where Chester is concerned. While probably not appropriate for very young children, this Pear production is definitely worth a look.